Virtual reality is all the rage in gaming circles, but did you know that it can have some practical uses for your daily life as well? Virtual reality (VR) is a computer-generated, 3D environment that you experience using specialized glasses or goggles. It’s long been the stuff of television fiction, and more recently has become a reality through mobile devices. Gamers are familiar with VR. They love the immersive experience within their favorite games. However, VR isn’t just for gamers. The technology is advancing quickly. As it does, an unexpected benefit has been uncovered: VR can help older people – Baby Boomers and beyond – in their daily lives. Some of the capabilities are still a few years in the future, but there are also some that are here right now. It seems like something out of a Sci-fi movie. You sit down, place a special set of eyewear over your eyes, and suddenly you’re transported back in the past, forward into the future, or even present day, just in some other location around the globe. It’s not fiction. It’s virtual reality, and as scientists have worked with VR, they’ve discovered that there are many ways to use it. For example, VR can be used to help patients who can’t remember to take their medications. A tiny, nearly invisible, sensor is compacted into the contents of a pill. It’s swallowed when the person takes their medications, and then after a specific time, the sensor triggers a reminder on a cell phone or other device that another dose of the medication is due. It’s also possible to use virtual reality to create interactive experiences, such as those generated by Rendever. These are real tours and adventures that are created to be 3D, then played back through the special VR eyewear. These tours can allow people to visit museums, concerts, or landmarks, swim with whales, even scale rock walls – all without getting up from their chair. The benefit of these adventures, according to scientists, is that it creates stimulation in the brain, which in turn releases chemicals that can reduce pain and increase happiness or satisfaction. These are just two examples of virtual reality, but the uses are countless. Some seniors are even able to go back into their past and relive or experience of the past, thanks to VR. That’s the beauty of this technology, and it’s just one of many that are coming which will be designed to help all people, including older adults, experience life as fully as possible. Aside from virtual reality, there are several other technologies that older adults have learned are helpful. For example, the virtual home assistants that are commonplace today – Amazon Alexa and Google Home. These devices allow users to control music, lights, anything that can be plugged into the wall, and even grocery deliveries, with their voice. They answer questions, and can also carry on simple conversations such as salutations, telling jokes, and relating facts from the web. Then there is the current trend toward small, personal robots. These little machines can be house assistants, and even virtual pets. Companies are working hard to design these devices to be useful to both older adults and to special needs adults, in an effort to help them remain independent for as long as possible. It’s no wonder these advances are coming, either. Scientists at MIT and private companies have discovered that VR and smart devices such as robots can help older adults live better, fuller lives. For example, the University of Arizona is using VR to help at-risk older adults improve their balance, build their muscle tone, and resume activities they may have had to give up in the past. 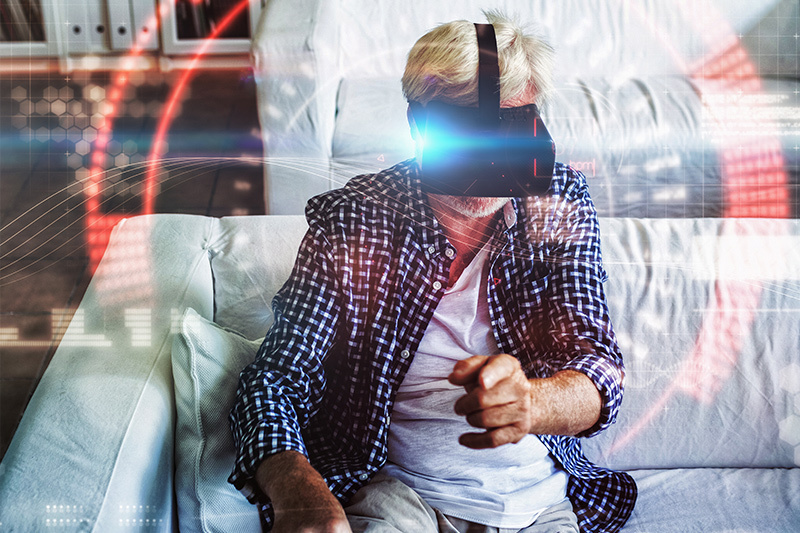 Other scientists have found that spending a few minutes participating in VR activities each day can reduce depression, anxiety, and stress in older adults. It’s even been said to reduce physical pain by as much as 24 percent - even after the person stops using the VR device. Technologies can be scary. At first glance, we might even wonder why in the world someone would want to use virtual reality? In truth, however, technology can help improve the lives of everyone, including older adults. So, the next time the grandkids want you to put on that VR headset and give it a try? Do it. It won’t hurt, and you may find the experience is much more fun and relaxing that you expected it to be. “Tech Revolution Benefits the Aging,” Sally Abrahms, June 2017, Kiplinger’s Retirement Report. “Scientists Test Virtual Reality Tools to Help Seniors,” Casey Kelly-Barton, Senior Advisor. “Virtual Reality Opens the World to Aging Seniors,” Rosie Wolf Williams, March 2017, MarketWatch. “A Whole New World: Virtual Reality for Seniors,” Catherine Misczuk, April 2017, Senior Care Advice.